1. To confirm the minutes of the 25th Annual General Meeting held on 4th April 2018. 2. To receive the council’s report on the activities of the club for the year ended 31st December 2018. 3. To receive the treasurer’s report and audited accounts for the year ended 31st December 2018. 4. To elect the council and to appoint auditors for the ensuing year. 5. To deal with such other matters as may be put before. 1. Dinner will be provided at 9PM and Networking will commence at the Pavilion Bar from 7PM. 2. Strict Dress Code Applies. Shirts with collar, long pants required. Slippers, sandals, short pants, T-shirts, jeans not allowed entry. 3. Kindly confirm your attendance for the AGM to sbcmsia at gmail dot com latest by the 11th of March 2019 in order for quorum and dinner arrangements. 1. To confirm the minutes of the 24th Annual General Meeting held on 15th March 2017. 2. To receive the council’s report on the activities of the club for the year ended 31st December 2017. 3. To receive the treasurer’s report and audited accounts for the year ended 31st December 2017. 1. Dinner will be provided at 9PM and Networking will commence at the Pavilion Bar from 6PM. 3. Kindly confirm your attendance for the AGM to sbcmsia@gmail.com latest by the 30th of March 2018 in order for quorum and dinner arrangements. 4. New members are welcome to attend to sign up for membership or renewals. 1. To confirm the minutes of the 23rd Annual General Meeting held on 23rd March 2016. 2. To receive the council’s report on the activities of the club for the year ended 31st December 2016. 3. To receive the treasurer’s report and audited accounts for the year ended 31st December 2016. 3. Kindly confirm your attendance for the AGM to sbcmsia at gmail dot com latest by the 12th of March 2017 in order for quorum and dinner arrangements. 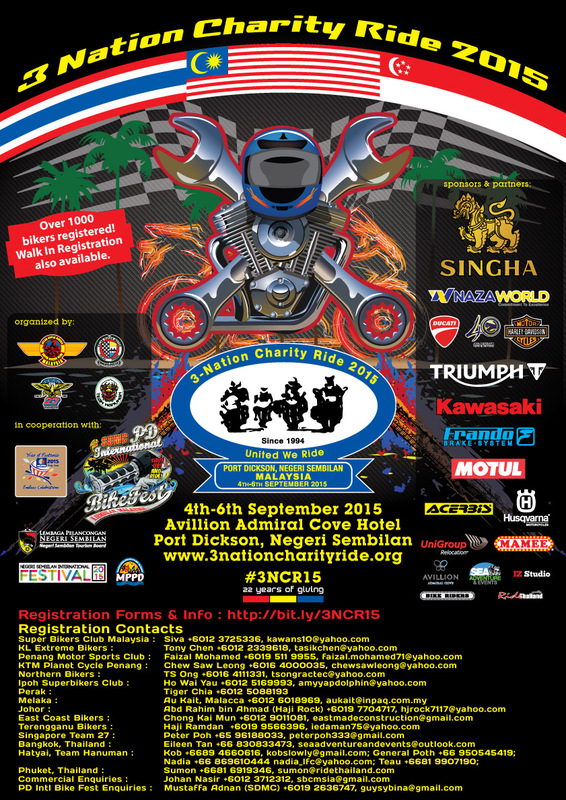 The annual 3 Nation Charity Ride will be held in the coastal town of Port Dickson, Negeri Sembilan from 4th to 6th September 2015 with Avillion Admiral Cove as the official event hotel. Now in its 22nd year, the event remains the longest running gathering of Super Bikers in the South East Asian region motoring calendar. This is the biggest event on the regional biking calendar and is participated by thousands of big capacity motorcycles and bikers from Thailand, Malaysia, Singapore and other countries around the Asian region. This yearly event is held to raise funds for charity and to bring bikers from across the borders together. Over the years, the event has raised more than RM1.5 Million which has been distributed to charity homes identified by the respective host country. The 3 Nation Charity Ride event has been rolling from strength to strength since 1994 and is organized annually on rotation by one of four founding clubs, which are Super Biker Club Malaysia, Penang Motor Sports Club, Team 27 Singapore and Team Hanuman Thailand. This year, the event comes to Malaysia with over 1000 registered participants to date, organized by the Super Bikers Club Malaysia (SBCM). 3NCR15 will see a collaboration with the Negeri Sembilan Tourism Board annual PD International Bike Festival currently in its 13th year, hosted by Southern Dragons Motorcycle Club (SDMC), happening on the same weekend. The festival is part of the calendar of events for Malaysia Year of Festivals 2015 (MyFest) and will feature bike merchandises & displays, games, food hawker stalls, live music and entertainment. The Welcome Gathering will be held at the venue of PD International Bike Festival on the evening of 4th September while the Charity Gala Dinner will be at Avillion Admiral Cove Hotel, Port Dickson, Negeri Sembilan on the evening of 5th September 2015. Updated: Over 1000 bikers have registered & paid so far to attend the event. Walk in registrations also will be accepted for bikers joining us last minute, however T-shirts sizes subject to availability while stocks last. Sponsors for the event include Singha, Naza World, Ducati & Harley Davidson, Triumph, Kawasaki, Frando Brake System, Motul, Unigroup Relocation, Husqvarna, Acerbis, Mamee, and other event partners. The participant’s registration fee is at RM160 each and includes the Charity Gala Dinner invitation, two Official 3NCR T-shirts, charity contribution & other gift collaterals. Total given out to date RM33,706.75. 1. To confirm the minutes of the 21st Annual General Meeting held on 20th March 2014. 2. To receive the council’s report on the activities of the club for the year ended 31st December 2014. 3. To receive the treasurer’s report and audited accounts for the year ended 31st December 2014. Ranggi Bikers Motorcycle Club, a motorcycle club with Charity as a mission are raising funds for Klang Special School. The 27-year-old Sekolah Khas Klang is in dire need of help as it is currently facing tough times coping with its financial situation. The school, which offers care, education and training for 150 children and adults, has been running in the red in recent years. Lack of government funding and contributions have compounded the problem. The school needs RM35,000 per month and RM500,000 annually to cover its operational costs. In recent years, the contributions in terms of cash had not been encouraging. The school’s only source of income is the RM100 school fee it receives from each child and that total fee will not even cover half of the monthly operating cost of the school. Even the school’s swimming pool had been kept closed for several months. Ranggi Bikers Motorcycle Club has raised more than RM90,000 so far (and still going) to support the school. In conjunction with the Merdeka celebrations, Ranggi Bikers would like to inform your good self that we would be handing over the cheque for “Charity On Wheels” on the 30th August 2014. Its would be great if we could get bikers to support us by spreading the awareness of our fund raising effort as it would aid us in our future charity events. Venue: Klang Special School, LOT 43416, Persiaran Tengku Ampuan Rahimah, Klang. 9:00am Ranggi Bikers will gather at Cholas Restaurant at Bukit Tinggi Klang for Breakfast - if you are not sure of this place kindly contact Naavin 012 35seven8001. 11:00am Arrival at Klang Special School. 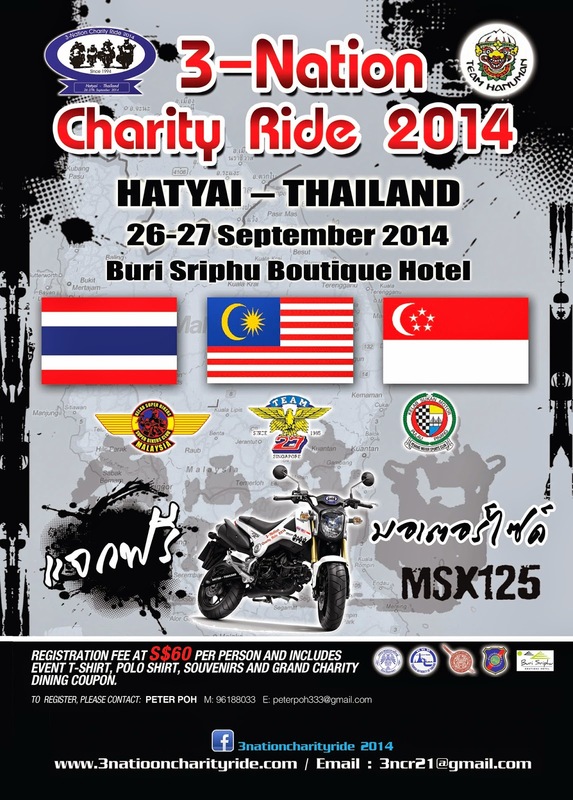 This year's 21st Annual 3-Nation Charity Ride event will take place in Hatyai, Thailand on 26 & 27th September 2014. Closing date for registration is 27th August 2014! Participant is limited to 48 riders only. Contact 012-9078 188 to book your spot. Hurry! 1. To confirm the minutes of the 20th Annual General Meeting held on 20th March 2013. 2. To receive the council’s report on the activities of the club for the year ended 31st December 2013. 3. To receive the treasurer’s report and audited accounts for the year ended 31st December 2013. There will be a one night trip to Betong Thailand on Friday 15th November by some of our committee members. Accommodation will be at Modern Thai Hotel. 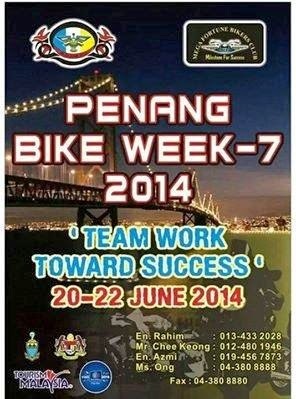 Any bikers interested to join can contact the committee for more information. On behalf of Xtreme Freedom Bikers Club, we are honoured to invite you and your delegation to participate in our Safety Forum, to be held on 21st September 2013 in Sri Damansara Club, Bandar Sri Damansara, Kuala Lumpur. Following the spirit of Cooperation, Development and win-win, we will discuss, sharing the safety issues in Super Biking which are of common concern to us. 1. Enhance Safety Riding among all bikers. 2. Understanding of safety aspects in Superbiking. 3. Expand the influence do Defensive riding. There will be a few experienced Panel members conducting this Safety Forum. The forum will last for half a day follow by dinner in the evening. The registration fee shall be RM 80.00 per participant which includes Forum participation, T- shirts and dinner. We are earnestly expecting the attendance of you and your delegates from your club so as to foster friendship, pursue common interest and promote "Safe Riding" and we will provide assistance as much as we can to facilitate your attendance. Let us make this "Safety Forum" an academic platform for all bikers to exchange their ideas and experiences and a bridge for all clubs to make friends and foster cooperation. I hope you are able to accept this invitation and looking forward to hearing from you. Additional information about the event , together with details about the Forum venue shall be sent together at a later date. I would be extremely grateful if you could RSVP by no later than 25th August 2013 or contact Ah Choo ( 0194802867 ), Tony ( 0122339618 ), Alvin Lee ( 0193389194 ), Raymond Loh ( 0122077601 ) or visit our FB : Xtreme Freedom Bikers Club for information. Motorcyclists face a unique set of challenges on the road since their preferred vehicle is smaller and handles differently from other vehicles on the road. Safety on the road is one of the most important considerations for motorcyclists, especially regarding accidents. The World Health Organization’s latest report shows that road traffic injuries caused an estimated 1.24 million deaths globally in 2010, down from 1.26 million a decade earlier. Half of these deaths occurred among pedestrians, cyclists, and motorcyclists. In light of these statistics, many companies are finding new ways to make coexistence between motor vehicles and motorcycles safer. Traditionally, many motorcycle organizations and state departments of vehicles encourage motorcyclists to flash their brakes when they decelerate, but a company called Vectolabs is looking to automate the deceleration warning. Vololights are a new type of light that illuminates when the motorcyclist slows down, regardless of whether or not the rider is using the brakes. According to an article from Fox News, Vololights will flash twice per second if a motorcyclist accelerates or downshifts, or flash five times per second if the rider uses the brakes. Vololights consist of two sets of LEDs built onto a license plate holder fitted with an accelerometer and CPU. Vectolabs claims the lights fit a wide variety of motorcycles, including some classic bikes like 1960s Vespa scooters. Vectolabs assumes the lights will conform to state and federal legal requirements, but urges interested riders to check their local laws before considering them. The lights have a stealth mode that turns off the system if the lights are not allowed. The Insurance Institute for Highway Safety reported in a study that motorcycles equipped with antilock braking systems (ABS) are 37 percent less likely to be involved in a fatal crash than models without ABS. Today, most major brands include the system on their biggest motorcycles and make it available to place on mid-level motorcycles, but more entry-level bikes would also benefit from the technology. Antilock braking systems allow riders to apply the brakes with full force without holding back due to a fear of locking up a wheel. ABS can also reduce brake pressure if a lockup is impending or increase pressure again when the bike is under control. Without the technology, a wheel can lock if the brakes are hit too hard or with the wrong front/rear distribution and cause the rider to lose control and eventually fall off the motorcycle. If the brakes are squeezed too gently on a bike without ABS, then the motorcyclist might not stop in time to avoid a crash. Antilock braking technology has raised doubt in many motorcycling enthusiasts, the New York Daily News reports. Many think the technology is a waste of money, impedes a new rider from actually learning to handle a motorcycle whatever the road situation and that it’s not failsafe. Nevertheless, studies of fatal crashes, insurance claims and test track performance indicate that antilock brakes are an important element of motorcycle safety. Sarah Parr writes about motorcycle safety issues for Freedom Cycle Magazine. 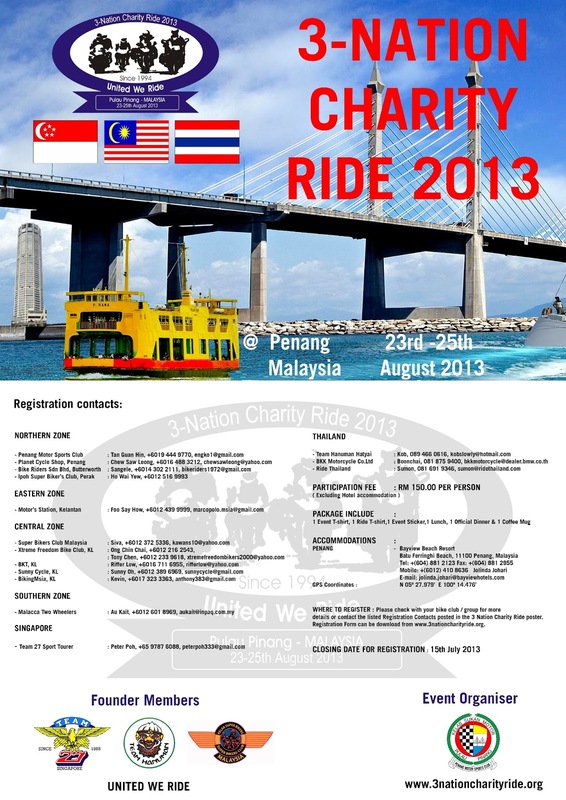 This year charity ride is hosted by Penang Motor Sports Club(PMSC) in Penang on 23rd August to 25th August 2013. Venue will be at Batu Ferringhi and Event Hotel is at Bayview Beach Resort. Event registration is RM150 per person. For more information, click to: http://www.facebook.com/events/583126401707936. 1. To confirm the minutes of the 19th Annual General Meeting held on 18th April 2012. 2. To receive the council’s report on the activities of the club for the year ended 31st December 2012.3. To receive the treasurer’s report and audited accounts for the year ended 31st December 2012. 1. Dinner will be provided at 9PM and Networking will commence at the Club Bar from 6PM. 3. Kindly confirm your attendance for the AGM to sbcmsia@gmail.com latest by the 5th April 2013. The participation fees is RM100.00 that includes a event T-Shirt and also a 7-Course Thai Dinner at the Mandarin Hotel in Betong at 7.00pm on the 15th June. For further information, please email: aukait @ inpaq dot com dot my for more details. 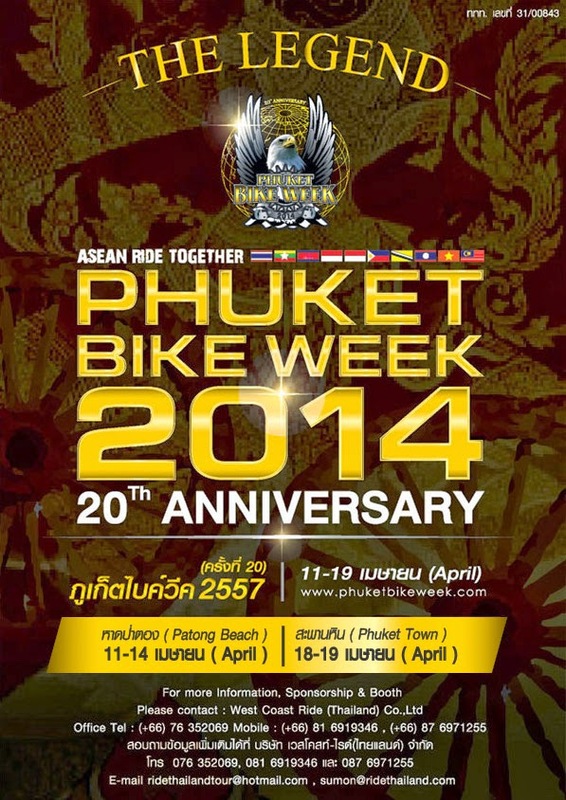 The 19th Annual Of Phuket Bike Week 2013 from April 14-21, 2013 (Official Event) at Patong Beach, Phuket Island, Thailand. The 19th annual PHUKET BIKE WEEK 2013 “ASEAN Ride Together” is the biggest motorcycle event in Asia. This event attract over 5,000 motorcycles with more than 30,000 visitors from 26 countries. This year it will take place from Sunday 14th-Sunday 21st April 2013 (Official event) coinciding with the world famous Songkran Festival (Thai New year) at Patong Beach Phuket Thailand. 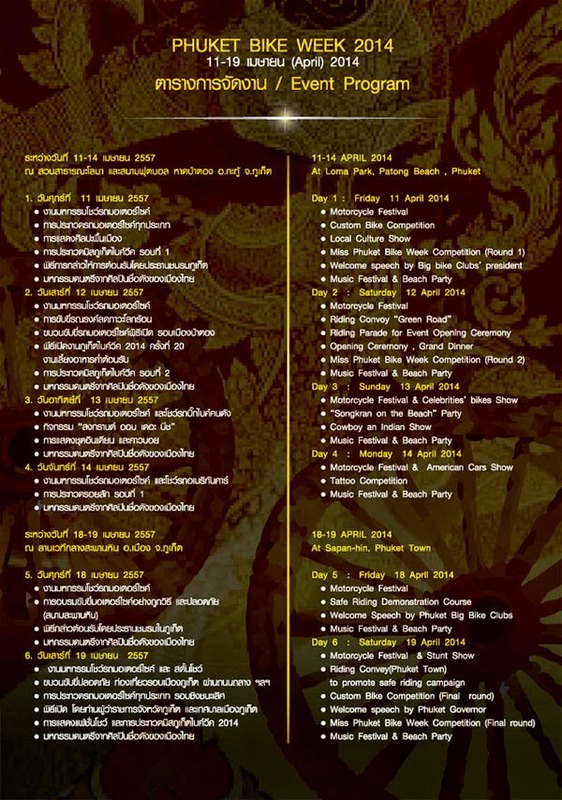 Brought to you by Phuket Provincial , Patong Municipality , Ride Thailand Magazine and Tourism Authority of Thailand. For more information on registration, head to: http://www.phuketbikeweek.com/ or download the Press Release. Join the 3NCR launch event in Kuala Lumpur at Sunny Cycle, No 37 Jalan Pahang, Setapak on 7th July 2012 from 12pm-6pm. 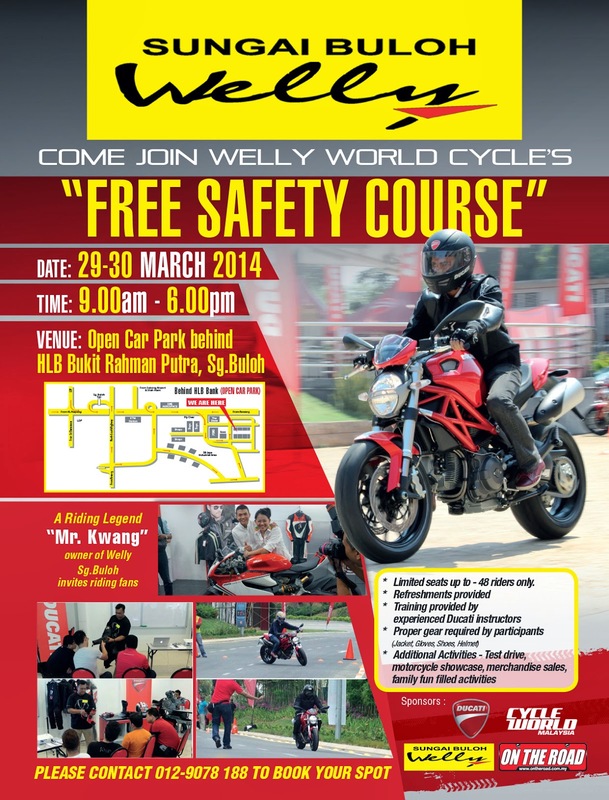 All super bikers are invited to attend. There will be food and refreshments for attendees. Bikers interested to the 3NCR can also register at the launch event. 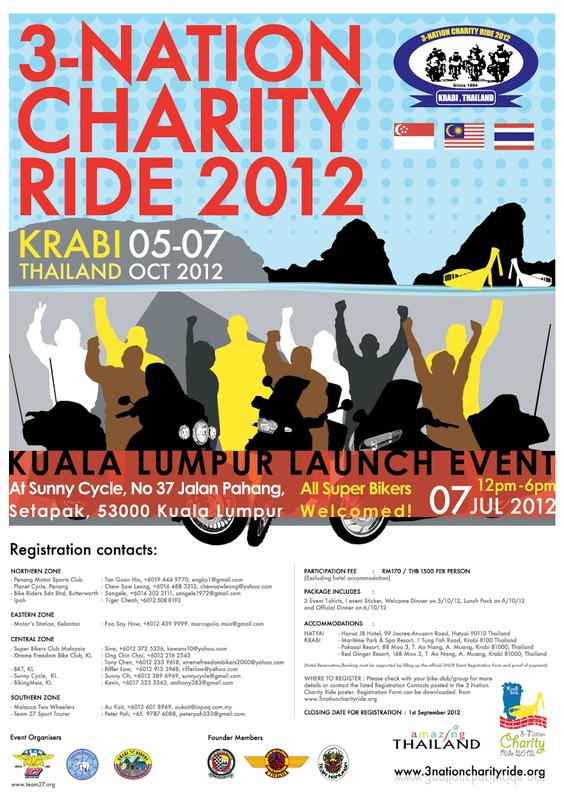 We are please to announce Team 27 Singapore is the host for 19th 3-Nation Charity Ride 2012 which will be held in Krabi, Thailand on 5 - 7 October 2012, with the assistance of 4 bike groups from Krabi and the Krabi Municipality. Team 27 shall be hosting the 3NCR Launch on Saturday 2th June 2012 4pm to 8pm at Alchemy Bistro @Central Mall, 3 Magazine Road Singapore 059572. Snack and refreshment will be provided. Beer and ciders are also available for sale at Alchemy at bikers price. All bike groups and past participants are invited to this launch. 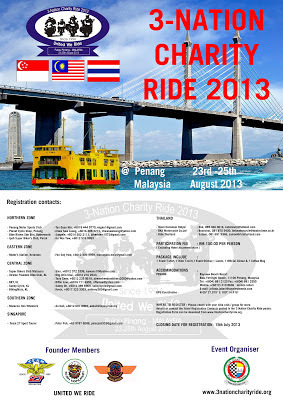 Please click 3nationcharityride.org to RSVP the number of bikers attending on or before 2nd June 2012, in order to prepare the snack and refreshment for all attending. We will commenced collection of event registration and hotel bookings on the launch. The event registration fee is THB 1500, RM170 or SGD$68 per person. Registration fee per person which include 1 ride t-shirt, 1 dinner t-shirt, stickers, welcome street party on Friday 5 Oct, day lunch & official dinner on Saturday 6 Oct. The other highlight of this year charity ride is the 300 km convoy ride from Hatyai to Krabi with police escorts and 50 route marshals on Friday 5 October. Hotels supporting the 3NCR are Hansa JB Hotel Hatyai, Maritime Park and Spa Resort, Pakasai Resort and Red Ginger Resort in Krabi. We are offering rooms at 3NCR rates and encourage bikers to reserve or book early as rooms will be taken up very soon by participants from Singapore and Malaysia during this forecoming launch and other launches to be held in Penang and Kuala Lumpur in the coming months. We thank all who have supported the past 3 Nation Charity Rides and look forward to your continous support and participation in this forecoming 3NCR. 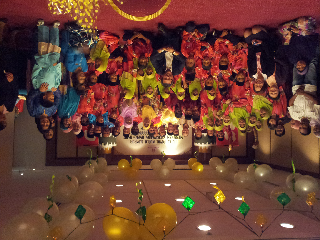 We pledge to make this year 3NCR a memorable event for all attending. Thank you. Copyright of Kelab Super Bikers Malaysia 1994-2012. Awesome Inc. theme. Powered by Blogger.